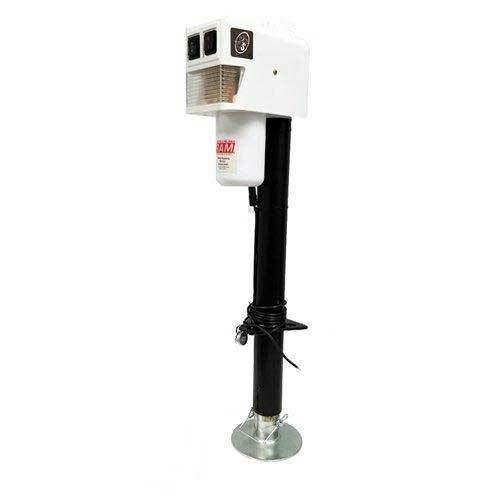 White top cowling 3,500 Heavy Duty Electric Power Jack. Easy to operate with just a flip of the switch. Durable exterior grade black powder-coat finish on outer tube. Zinc finish inner tube with removable sand foot. 18" travel height. Bright LED light for easy night time hookup. Include a drop leg for 7-1/2" of additional adjustment. Durable hardened steel gears for year and years of normal use. Crank handle for manual override in case of power loss. Setup for 12 volt battery use.